(ISJM) I am a little late posting a link Judith Matloff's December article about the desperate need for care for abandoned Jewish cemeteries in Belarus from The Forward, but the situation has hardly changed in two months. I've written about the dire situation in Belarus before especially regarding former synagogues. The situation with cemeteries is also serious, though is some ways more under control. 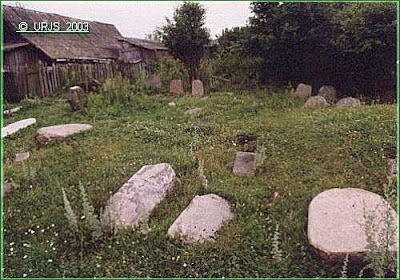 The great damage to most Jewish cemeteries in Belarus was done in the past, and (most of) those cemeteries that were mostly likely to be destroyed during the Soviet period have been already been built over and bulldozed. But throughout the country there remain scores of rural cemeteries whose main enemy at the moment is time and weather, both of which have been taking their toll for years. Due in part to their location and in part due to the still slow economy in autocratic Belarus, these places are neglected, but not are not under siege. In some ways the authoritarian system in Belarus adds some level of protection - if no resources. There is less individual entrepreneurship or land speculation, or local governmental initiative in Belarus that could threaten these places than was the case elsewhere in Central Europe, and is still true in Ukraine. Politically, this is a good time to encourage intervention to clean, fence and otherwise protect the remaining Jewish cemeteries. But economically it is a bad time to find money for the in Belarus - and the precisely because of politics most potential foreign philanthropists and investors are understandably reluctant to send money. The result is that with some encouragement from small underfunded American and European organizations, the the initial enthusiasm of American Hillel students, the small Jewish community in Belarus has begun to work on their own to protect the Jewish heritage. They have the willingness, and increasingly the hands of young people to carry out some of the needed work. But they still lack needed funds for essential skilled work and supplies. Read Judith's piece. Like most stories about recovering Jewish heritage in Eastern Europe it is poignant, with a ray of hope - the hope here is not that this is just a group of American college kids visiting for a few weeks to cut cemetery weeds (though there is nothing wrong with this) - but that it is home-grown effort. If there are individuals, organizations or congregations who would like to contribute to Jewish efforts in Belarus to save remnants of the past - as a way of building community identity today - contact me. I'll put you in touch with people in Minsk and elsewhere doing good work for little money. Published November 24, 2010, issue of December 03, 2010. Gomel, Belarus — Somewhere beneath the birch trees lies the Jewish cemetery of Senno. The graves have been there for 350 years, but the markers are so sunken into the earth that they look like random stones. Moss covers the Hebrew letters, and few people know about the site, which is hidden from the road by the foliage. The only visitors are mosquitoes. Kestenbaum & Company is presenting their 50th Judaica auction since 1996 - and it features a wealth and variety of books, manuscripts, artworks and ritual objects. Browse the catalog...Buy something for your favorite Jewish Museum of University Library! Click here for a summary of the various collection offered.